Before proceeding with this process, be sure to read the help article relating to Promotion Management. It explains the three methods you have as options. This article contains instructions for using the Mixed method, which will give you a balanced mixture of students based on gender and attendance. The ministry over those classes can perform these steps. The roles required are Access and Edit . After you have verified that Promotion Setup and Promotion Prep have been completed, you are ready to move the students into their Pending Classes. Here is a short video demonstration using this method when managing Promotion. See below for explanation of the Promotion Totals. To get a mixture of children based on gender and High, Medium, or Low attendance go to either Organizations > Manage Promotion or Administration > Manage > Promotion . Promotion type / group This drop down menu is populated using the Description from Promotion Setup. Example: 1st grade to 2nd grade. Schedule If you have classes at only one hour you do not have to select this. The schedule will be displayed along with the name and leader of the org. Unassigned Only If you want to filter out any students that you have already assigned to a Pending Class check this box. Exclude Teachers If you are promoting the teachers with the class do not check this. Click the Mixed column header in order to get a random sort of students. After you have the random sort, select the Target Class . This is the class into which you want to promote the students, also called Pending Class . In order to take advantage of the random Mix, go straight down the list and select the number of children you want to move to the Target Class. This will give you a representative mix of children to move to the Target (Pending) class. In other words, each class will have an appropriate number of High, Medium, and Low attenders as well as a mix of Males and Females. Click the first person in the list, hold down the shift key, click beside the last person you want to select, and all students in between will be selected. Now click the blue Assign to Class button and wait for the page to refresh. You can uncheck Unassigned Only to view the assignments. After you have verified the assignments, select Unassigned Only again and continue as above starting with Step 2 until all students within that division/hour have been assigned. Remember to change the Target class before you assign more students. Select a different Schedule - if you have classes within that same Promotion Type but a different Schedule - and proceed again with Step 2. (f you are finished with that Promotion Type, start back with Step 1, selecting a different Promotion Type. 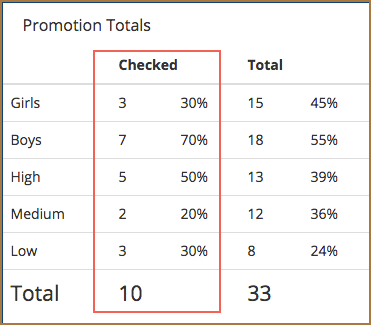 The Promotion Management page contains a section for Promotion Totals. It is like a sticky note that will float as you move down the page. This helps you evaluate the balance of the classes. 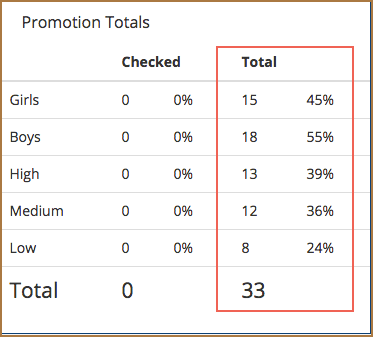 Before any students have been selected, the Promotion Totals will show you stats about the gender and attendance breakdown of the students within the selected promotion group. As you make selections, the stats in the Promotion Totals will change to indicate the makeup of the Pending class. Below are explanations for the numbers in the above image. Both the Gender and Attendance change as students are selected. The assignment is actually putting the students on the Pending tab of the new organization. When viewing that tab, you can use the toolbar to send emails, print labels, etc. without including the current members of the class. When you finish this process of assigning students to pending classes, refer to the Annual Promotion article for your next steps.